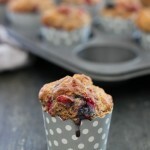 Sticky Wholemeal Raspberry and Blueberry Muffins sold in many Sydney cafes. You know the ones?? Big top, shiny brown crust, tangy berries on top… Now homemade and loved by the kids. Wholesome, low sugar and dairy-free option for the lunchbox and afternoon tea. Our habits often revolve around food, don’t they? Think about the ritual of sharing a meal with an old friend, or being woken up to the smell of freshly brewed coffee as you enjoy a sleep in on Saturday. Think also to weekday breakfasts at work. Or before work. Do you have breakfast at home or grab something small on the go? When I worked in the city, I would take a leisurely 15 minute stroll to the office, stopping only twice on the way. Firstly, to grab a freshly brewed cup of coffee from Toby’s Estate across the road from where I lived. My second stop was downstairs from the office. You see they sold THOSE muffins. Wholemeal Raspberry or Blueberry kind. Big top, shiny brown crust, tangy berries on top… I’d get one of these almost every day. They were being sold as the healthier option, but I am not sure either way because it’s so hard to tell with these sorts of food. What has gone into making them always remains a bit of a mystery. Now, it’s been over two years since I’ve had one, frankly, I’m not even sure that they still sell them. The moment I bit into the moist, sticky cake dotted with sweet and tangy fruits I was in heaven. Having already gone through sacks of ingredients in my quest for the perfect cafe-style wholemeal raspberry muffin I have finally managed to fine-tune the recipe! Let’s say the following mixed berry version is ultimate favourite because it always used to be so hard to decide between a tangy raspberry or sweeter blueberry fix. Of course, in an Autumnal twist on the traditional, you could make them with figs instead… Indulgent. 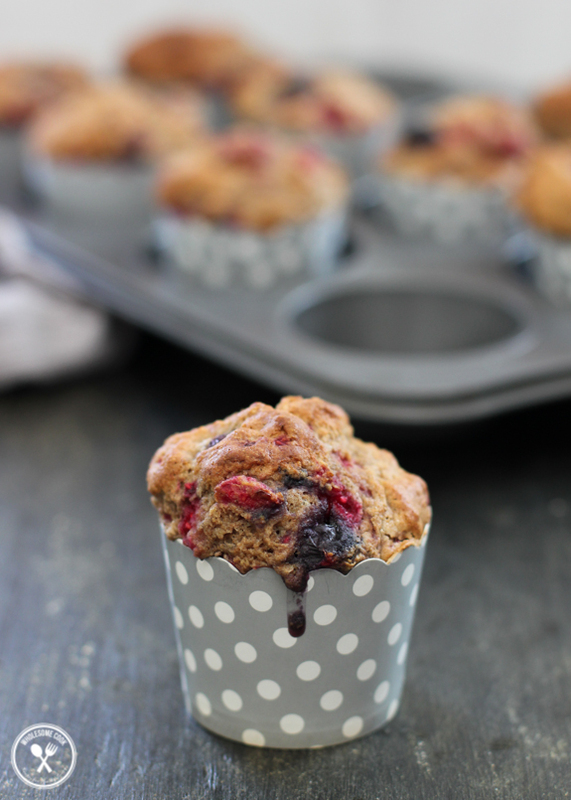 And for those of you who know which muffins I’m talking about, enjoy this homemade and definitely healthy version. To those of you who are curious enough to try… I packed them into the kids’ lunch boxes the other day and, despite not being big fans of berries – yes, I know (?? ), they ate them with joyful glee. You can also use a mixture of blueberries and raspberries or swap one berry for a couple of figs, or stick with one berry type if you prefer. 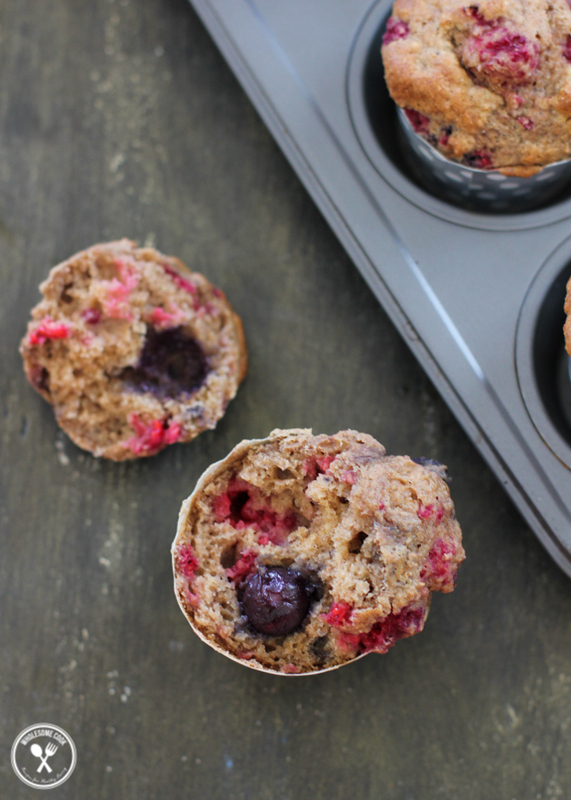 The muffins are great for kids' lunchboxes or an office breakfast. For a dairy free version, substitute buttermilk with almond milk and coconut yoghurt as per option below. For a low sugar version, feel free to use natvia. I used a 1/4 cup capacity ice cream scoop to pop the batter into my cases. Makes 9-10 muffins. They'll keep uncovered for a couple of days. A note on sugar: in my original recipe I used 3/4 cup brown sugar which obviously give you a more caramelised flavour and crust. However, since cutting down on processed sugar consumption I've been using coconut sugar instead. And a good touch less. Preheat oven to 190C (170C fan forced, 375F, gas mark 5). Line a muffin tray (9-10 holes) with baking paper squares or cupcake patty liners. Combine flour, baking powder and sugar in a large bowl. Add berries and walnuts, if using, and stir to coat. Add the buttermilk, oil and egg, and stir with a metal spoon until just combined - do not overmix. Spoon about 1/4 cup of batter into each pan. Bake in preheated oven for 25 minutes or until a skewer inserted into the centres comes out clean. Turn onto a wire rack to cool. Serve warm or at room temperature. Yum! They look very cafe style. Frozen raspberries are such a great thing to have on hand. I use them in heaps of things. I’m a big fan of muffins in general. 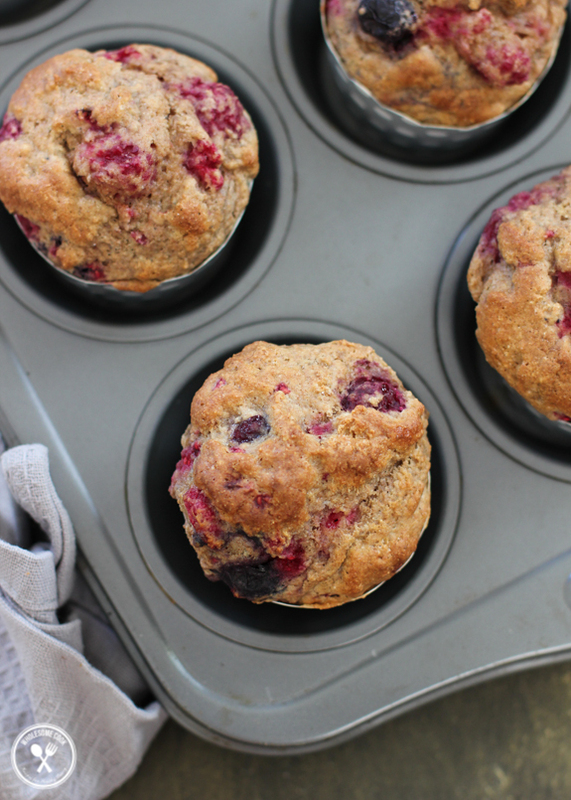 Not the cake-like muffins you buy in the store, but warm home-baked muffins like these – loaded with fruit and good for you ingredients. Lovely muffins! I made these this morning although I don’t think I added enough baking powder so they didn’t rise as much as the picture but they were delicious nonetheless. I also ran out of brown sugar and used honey on the figs as the glaze. Yummo! Wow! I’m impressed you got baking in the morning! Wow. These look amazing. I am going to try these this weekend. I’ll stop back and let you know how it went! Looks like everyone is having muffins on the weekend 🙂 Enjoy ladies! 😀 I know, they are the best! Made with raspberries and apple recently and they were just as nice! Enjoy! The tops look so crispy and perfect and they look packed full of flavour! I was looking for something to bake with my daughter and remembered that I used to make these really delicious wholemeal muffins. 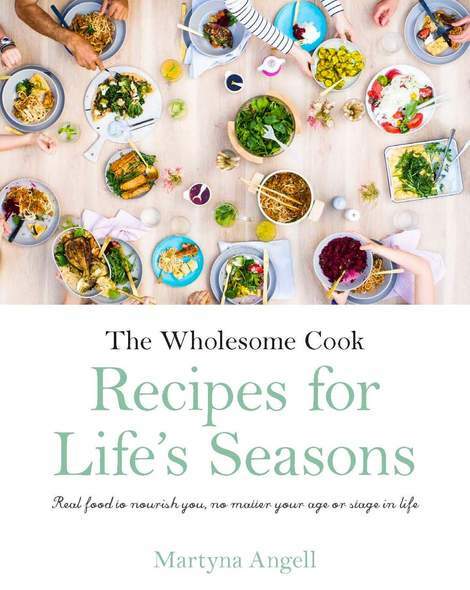 This isn’t how i remember them though – have you tinkered with the recipe? What quantity of ‘normal’ sugar should I use? Well I had a go at these but they did not rise at all, despite what I thought was a huge amount of baking powder. To be fair I don’t have a very good oven in my flat but other muffins I make rise just fine – perhaps I over-mixed the ingredients, though I only mixed it until all the flour and sugar etc were completely incorporated. They still tasted nice though so I’ll give them another go sometime and perhaps use a higher temperature.